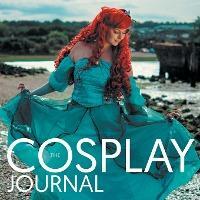 The Cosplay Journal is a coffee table publication, focusing on the Diversity and Craft of cosplay. We show that anyone from any walk of life can get involved in cosplay, and that we are all capable of learning new skills, creating amazing things and bringing joy into our own and other people's lives through the art of costume making. The second volume features "Craft Focus" articles on Sewing, Photography and Armour, as well as interviews with Vicky Magee, a prominent voice for disabled cosplayers; Hannah Alexander, a well-known cosplay designer; and Julie Morrisroe of Cosmic Workshop, who's made cosplay crafting their career. We look behind the scenes of Competitive Cosplay in our opinion piece, explore the art of cosplay posing and look at ways to make your cosplay workspace more functional. All of this is accompanied by images of cosplayers from around the UK, showcasing the amazing skill and artistry within our community.